Cartage Bishop Deogratias ransomed many captives by selling vessels, works of art, vestments and ornaments from his Churches. The image to the right, shows the ruins of Carthage, where Deogratias, a north-African priest, was chosen to be bishop at the time of the Vandal invasion. Patrick Duffy tells his story. Deo gratias is a Latin liturgical formula meaning “Thanks be to God“, a response close to every Christian’s heart and lips. Every pre-Vatican II altar-boy who served a Latin Mass had be alert to make this response when the priest finished the reading of the Epistle and when the celebrant finally said ‘Ite, Missa est’ (Go, the Mass is finished, or you are dismissed, at the end of Mass. The Vandals were a mixture of Slavic and Germanic tribes who had embraced the Arian version of Christianity as they overran the Roman empire in the 5th century. After passing through northern Italy, France and conquering Spain, they crossed into North Africa and in 439 captured the city of Carthage. They put the Catholic bishop, Quodvultdeus, and most of his clergy, aboard a leaking hulk which somehow reached Naples. But the city was left without a Catholic bishop for fourteen years. At the request of the Roman Emperor Valentinian III, Genseric, the king of the Vandals, allowed a new bishop to be chosen for Carthage. In the 5th century it was also the name of a priest chosen to be bishop of Carthage (in present-day Tunisia) at the time when it was occupied by the Vandals. He did much to ransom and care for the slaves brought there after the Vandals ransacked Rome. His example and teaching strengthened the faith of the people and he was respected not only by Catholics, but even by Arians and pagans. In the year 457 Genseric attacked and sacked Rome from North Africa. 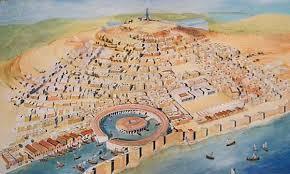 He returned to Carthage with many captives, whom he distributed as slaves among Vandals and Moors. Husbands were separated from wives and children from parents. Deogratias ransomed many of these captives by selling gold and silver church vessels, works of art, vestments and ornaments. He filled two of the largest churches in the city, the Basilica Fausti and the Basilica Novarum, with bedding to provide accommodation and organised a daily distribution of food. Deogratias’s charity was resented by the Arian faction, who tried to assassinate him, but failed. However, his efforts seem to have worn him out and he died after being bishop for only three years. So many people wanted to get relics of him that he had to be buried secretly while the public prayers were being chanted at his funeral. The people he helped would never forget him. 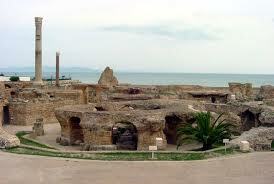 After Deogratias the Vandals would not allow Carthage to have a Catholic bishop for another twenty-three years.